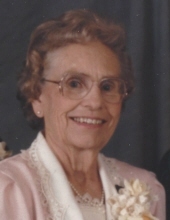 Geneva Charlotte Katherine (Wiechert) Grimpo, of rural Carrollton, formerly of Wakenda, Missouri, peacefully passed away Tuesday afternoon, October 23, 2018, at Brunswick Nursing Home and Rehab in Brunswick, Missouri. Geneva lived a faithful and vigilant earthly life of 94 years, 9 months, and 2 days. On Monday, January 21, 1924, on a farm near Wakenda, the Lord blessed the home of Herbert Henry and Dora Katherine (Bultmann) Wiechert with the arrival of their only daughter in their home of four children. Growing up in a farming community and having three brothers provided Geneva with many opportunities to cultivate the attributes and strengths that she possessed throughout her entire life. She attended Walnut Grove Elementary School and the Immanuel Lutheran Parochial School. When she was eighteen, she accepted the proposal of her hand in marriage, and, on February 8, 1942, at Immanuel Lutheran Church in Carrollton, Geneva shared sacred vows with Buddie Marvin Grimpo. The union was richly blessed with three children: Donna, Yvonne, and Alan. Buddie sadly preceded her in death on April 1, 2006, after sharing 64 years of an abiding marriage. Geneva was a loving mother and grandmother. She believed her most important roles were being available to her children and accommodating the responsibilities of being a homemaker, mother, and wife of a farmer. She passed many of these traits to her children, teaching them leadership, loyalty, faithfulness, and independence. She was a constant help to Buddie in the fields from planting time to harvest by driving the tractor, hauling grain to the elevator, hoeing weeds, or clearing brush out of the pecan orchard. Many days during harvesting, she would pack lunches and snacks to supply the children throughout the day and sometimes into the night while she helped in the fields. She continued this same routine with the next generation, providing the same to her grandchildren by allowing them to ride in the tractor with her while she worked the ground. In the quiet times when the crops were growing, she raised a wonderful vegetable garden that provided produce that she canned and froze for her family’s use throughout the year. She loved working in her flowerbeds of begonias and geraniums. She enjoyed making splendid needlework and crocheted creations. She was a wonderful cook and anticipated the hosting of the family for holiday meals. She loved to be outdoors where she could listen to the birds. She had an owl that answered her calls and a pair of pheasants that visited regularly. She knew each of their unique calls. There were many visits from the grandchildren, and one of their favorite past-times was to climb the “Gumball Tree.” They also helped harvest the orchard of over one hundred pecan trees. Geneva loved the comfort of her home and having her family close by. Geneva understood longevity and the hard work it took to manage, accomplish, and preserve the three separate century old farms for the need of the future generations. Geneva was loyal to her memberships in the many clubs and boards on which she served: Enthusiastic Workers Extension Club; Project Leader for Peppy Workers; Immanuel Lutheran Ladies Aid Society (LWML) where she faithfully held many offices; She taught Sunday School, Weekday Bible School, and Vacation Bible School ; Lutheran Braille Workers; Immanuel Lutheran Church choir; Immanuel Lutheran Church flower committee; and Forum Federated Women’s Club. Geneva loved God and believed in living her faith. She was a lifelong member of Immanuel Lutheran Church, Carrollton, and recently attended St. John’s Lutheran Church, Brunswick. Geneva is survived by two daughters, Donna Katherine Straub and husband Dennis, Brunswick, and Linda Yvonne McDonough and husband Wayne, Carrollton; a son Alan M. Grimpo and wife Elizabeth, Carrollton; two brothers , Erwin Wiechert of Albuquerque, New Mexico, and Orville Wiechert and wife Fannie, Columbia; five grandchildren, David Straub, Katherine “Katy” McDonough, Christopher Grimpo, Jessica (Dustin) Southard, Kyle Grimpo; six great-grandchildren, Quinn, Violet, Bron, Mason, Brooklyn, and Bailey. She was preceded in death by her parents, Herbert and Dora; her husband Buddie Grimpo; brother Harold; sister-in-law Bertha Wiechert; and niece Kathy Ross. Funeral Services will be held at 2:00 p.m., Saturday, October 27, 2018, at St. John’s Lutheran Church in Brunswick, Missouri with Pastor Glen Drewitz officiating. There will be a gathering of family and friends held one hour prior to the service from 1:00 p.m. to 2:00 p.m. at St. John’s Lutheran Church. After the services, we will leave in procession to Carroll Memory Gardens, Carrollton, Missouri where Geneva will be peacefully laid to rest next to her sweetheart. Pallbearers for Geneva will be her grandsons: David Straub, Christopher Grimpo, Kyle Grimpo, Dustin Southard; and friends of the family: Gary Vogelsmeier and Pat Lock. As an expression of sympathy and in memory of Geneva, memorial contributions are suggested to The Lutheran Hour or the Immanuel Lutheran Radio Fund. Serving the family, Foster Funeral Chapels, Carrollton, Missouri. Online condolences may be left for the family on our website www,fosterfuneralchapels.com or connect with them on our business Facebook page: Foster Family Funeral Chapel and Cremation Services, LLC. To send flowers or a remembrance gift to the family of Geneva Charlotte Katherine Grimpo, please visit our Tribute Store. "Email Address" would like to share the life celebration of Geneva Charlotte Katherine Grimpo. Click on the "link" to go to share a favorite memory or leave a condolence message for the family.